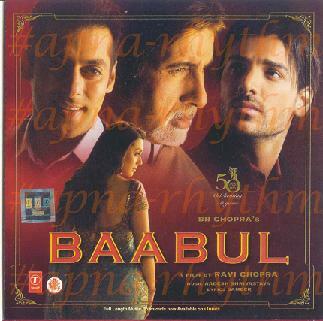 Walking into the theatre, I kept hoping that “Baabul” would be as engrossing as Ravi Chopra’s last outing, “Baghban”, if not more. Being a sucker for emotional flicks and a die-hard fan of the school of family filmmaking, I was looking forward to a fun time and went in ready with tissues expecting some sobbing moments (Yes folks! Boys cry as well!). Boy! I was wrong! Name: Baabul Age: Born in the 1950’s and witnessed time and time again through the 70’s and the 80’s. “Baabul” suffers from what is called, “Scriptlessititus”, a common syndrome witnessed in Hindi movies where the symptoms include lack of characterization, clichéd dialogues, irritating situations and an extremely featureless treatment. A more serious bout of Scriptlessititus, further leads to a movie’s inability to communicate with its audiences and sadly, that’s exactly what happens here. “Baabul” is a dying patient, and a very weak one at that. Ravi Chopra surely must have meant well, but the movie just doesn’t connect with its viewers. Dialogues, barring the penultimate scenes, fail to stir the spirit, characters are underdeveloped to say the least, and direction is plain mediocre. The theme of widow remarriage, as old-fashioned as it may sound, holds unlimited potential to pack an unending supply of heart-wrenching emotions and soul-pounding lines even for today’s urban audiences – yet “Baabul” fails on that account as well. 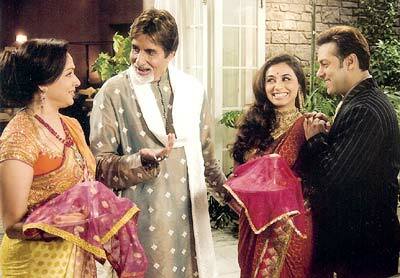 The reason why “Baghban” worked, despite its recycled theme, was because each and every sequence by Mr. Chopra was a masterstroke, the emotional quotient was exceedingly overwhelming, and the characters, despite their woeful circumstances, appeared dignified and managed to break the usual stereotype that often handicaps Hindi film characters. But with “Baabul”, Mr. Chopra takes one huge step back and bundles in every cliché thinkable, every trite situation conceivable and every stale sequence of dialogues humanly possible. Additionally, the characters are as stereotypical as they come and don’t really help the movie rise above the plunging depths of mediocrity. Now lets talks about the people associated with “Baabul” and see what this doctor can recommend for them to break away from the effects of Scriptlessititus. Starting off with the director, Ravi Chopra, I am sorry to say Mr. Chopra but this is one shaky ship. Although it might make it to the shores of success at the Box Office, the journey will be nothing to write home about. Your efforts simply don’t match up to your earlier films. You surely had your heart in the right place, but you forgot to bless this movie with a heart of its own. For you, the doctor prescribes: 1- A better script next time; 2- Originality in treatment,l; and 3- A promise to continue making family-oriented flicks, only a lot better than “Baabul”. Now to you Mr. Aadesh Shrivastava: You may want to boost off your musical prowess on “reality” music shows but from what I heard in “Baabul”, your music seemed just as fake. You surely did a good job with “Bawari Piya Ki”, but it seemed like you handed over the reigns of composing the remaining tracks to one of the contestants on the show you served as a musical mentor on. As for the writer, Dr. Achala Nagar, I can only say that this patient of yours named “Baabul” has died an untimely death, not for the severity of its ailment, but for your inept care and therapy. Being a fellow doctor, my prescription for you includes a strong suggestion that you go back to doing what you do best and leave screenwriting to the more qualified. For Mr. Godfrey Gonzalvez, the editor, I recommend that you buy a new, sharper pair of scissors and whenever John Abraham comes on screen, just chop the whole scene off. Now to the onscreen performers, beginning with Mr. Bachchan’s Balraj Kapoor: Although the script doesn’t serve you well Sir, you have done all you could with this role. You play the title character, but surprisingly, for most of the movie, are relegated to the background. Whenever given the opportunity to force your way into the proceedings, you have done great work, as you always do. For you I would prescribe: 1- More movies with Salman as you guys rock the screen whenever pitted together; 2- Keep playing such roles for there’s no one who can do it better than you. 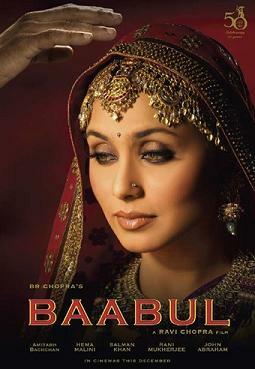 Will Ms. Rani Mukherjee please stand up? First things first, your character just doesn’t evoke sympathy. Not entirely your fault as you can always blame it on the script, but how about improvising a bit and at least trying to rise above a spineless character? In “Baabul”, you do what you have been doing for ages now.Your Malvika seemed aesthetically-challenged for most part and your horrendous choice of makeup and outfits made your amateurish paintings look better. For you, this doctor prescribes 1- An immediate switch to a new dress designer as your garish outfits don’t help your cause, 2- You might want to consider a new aesthetician and finally, 3- How about spending a couple of hours with an actual golf expert and at least making your swing a bit more resembling to that of a Golf pro’s daughter? After all, it is all about getting into the skin of the character, isn’t it? Ms. Hema Malini a.k.a. Shobhna Kapoor: Ma’am, I am sure that you knew from the very beginning that you wouldn’t have much to do in the movie. However, your role could have been much more substantial and stronger. As for prescribing something for you, if I were you, I would use some Strepsils or Halls before mouthing those emotional lines. Yes, Mr. Salman Khan, you’re up next. As long as Avinash Kapoor was in the movie, it was somewhat tolerable. Agreed, you would have preferred to be killed instead of sitting at that stupid coffee shop trying to pick up Malvika or staring at the sunset while mouthing those incredibly corny lines, but I am glad that you somehow managed to stay alive till the intermission. And you surely seem to have matured into a fine onscreen daddy, for it is not common to see a superstar look so believable in warm, sweet scene with his four-year old. But that doesn’t mean that you have done your job completely well. What is with those over-expressive facial gestures? Agreed you want to be funny, but at times it all tends to go a bit overboard. So curb your enthusiasm a bit. Also, I would strongly prescribe, 1- I recommend at least 8-9 hours of sleep a day; 2- Try hiring a personal trainer and start hitting the gym; and 3- Taking a few language lessons could actually help fine-tune your, at times, scratchy Hindi. By the way Mr. Khan, was it just me or was your wife a real lousy painter? Mr. John Abraham, you did manage to make my friend exclaim, “He is so Hot” every time you popped up on the screen. I am not sure if the same could be said about your performance as Rajat. Playing the guy who always gets to be the best man, but never the groom, your good boy act just didn’t go down well with me at all. Let’s just say that your acting is as good as your dancing – go figure! For you, this doctor prescribes, 1- Some shaving foam, 2- A nice shaving razor preferably with 4 blades and 3- A Career change. Mr. Om Puri, I must first congratulate you for you are the first person who has single handedly managed to put today’s high-tech, high-powered Dolby Digital sound systems to shame. For a moment I really thought that the loudness in your voice will blow the ceiling up, tear the walls apart and will bury us all in the ruins of what once used to be a multiplex theatre. Even the high Dolby standards were no match for your intensely earsplitting vocals. For you Mr. Puri, this doctor prescribes, 1- Watching “Baabul” in a theatre to realize what I went through every time you mouthed those loud lines; 2- If not for us, think of those little children who would not be able to sleep at night fearing you’ll pop out of nowhere screaming, frightening their little, innocent lives out of them; and 3- Please don’t reduce yourself to such inconsequential roles as you have done a lot better than this. For the hoards of character actors who pretty much make blink-and-miss appearances in the movie, this doctor can only say one thing – for God’s sake get a casting agent! And finally for all those planning to experience “Baabul”, this doctor suggests staying home and watching “Baghban” instead because with “Baabul”, Mr. Chopra’s intentions are clearly there, his execution is not. This doctor’s shift is now over.